Kennesaw State head football coach, Brian Bohannon will feast his eyes on hundreds of young men as he hosts the first football event at Fifth-Third Bank Stadium. A 7-on-7 passing tournament will be held July 10-July 12 as some of the brightest high school talent from around the state take part. In an interview with the Marietta Daily Journal, Coach Bohannon said, “We’re going to have nine different teams each day and 27 teams total. Each team will get to play six games and really get to test themselves against some quality opponents. “This camp was a huge goal of ours,” Bohannon said. “We wanted to get as many of these athletes to campus as we could. We can show them what KSU has to offer. 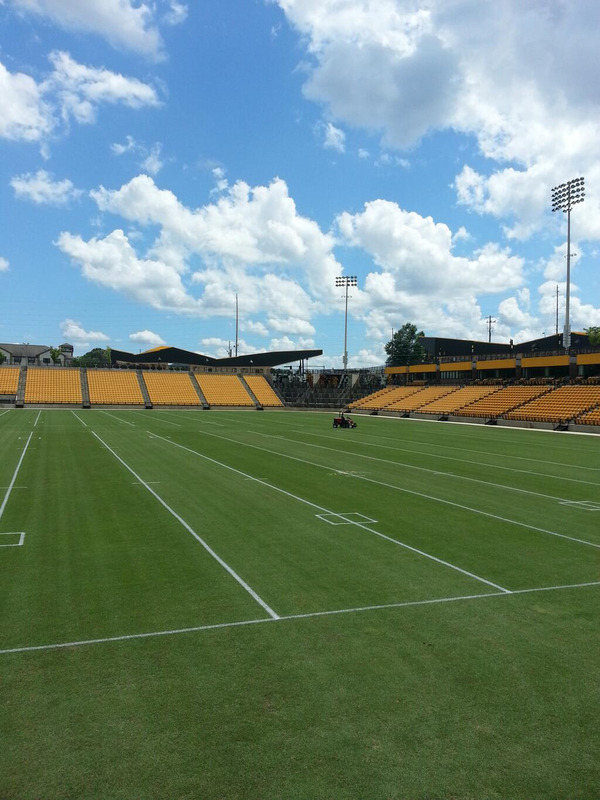 Assistant Coach Liam Klein painted the picture of what Fifth-Third Bank Stadium will look like lined for football. It is a sight that Kennesaw State fans have been aching to become a reality for more than a decade. As the time gets closer to Kennesaw State’s own football team to take the field, the little things will bring abrupt reaction by Owls fans. We watch waiting for ESPN to include Kennesaw State on its football page. For Kennesaw Sate to get a blurb in an Athlon Football magazines. For Kennesaw State to reveal the conference they will call home. For Kennesaw State to have a full roster of players battling for starting positions. And finally, for Kennesaw State to storm Fifth-Third Bank Stadium with a raucous crowd, the sound of a marching band, and the crackling of pads as it is game time for the Owls! Thanks you Coach Klein for sparking that imagination that will soon, but not soon enough, be a reality, football at Kennesaw State! Posted on July 9, 2013, in Uncategorized. Bookmark the permalink. 1 Comment. Loving the concepts so far. Great stuff. Now just waiting on the full “blackout” uni. All black with the matte helmet, facemask and chinstrap black as well. The owl head on the helmet might look good with this look. Anyway, keep up the great work! Digging what you’re doing.